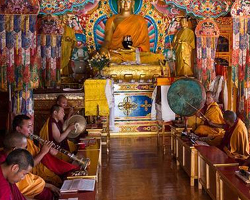 The predominant religion in Ladakh flaunts a very beautiful and harmonious form of Tibetan Buddhism that will surely make its way into your heart, although Islamic influences are found from the Kashmir Valley, the major religion of Ladakh is Budhism and more than 77% population of Ladakh is Bhddhist followed by Muslim population around 14%. Prior to Islam, Hinduism dominated Kashmir and there are 8% Hindus too in Ladakh. Religion in Ladakh is about spirituality, peace and brotherhood. All religious books and prayers are in the Tibetan language, Most of the chants are in Sanskrit or Tibetan. The monastic orders in the gompas and the artwork is clearly Tibetan in origin. The gompas represent the monastic side of Buddhism, or lamaism. The walls of gompas are painted with illustrations of the Lord Buddha, his manifestations and followers. The Ladakhi culture is similar to the Tibetan because of the region’s close proximity with Tibet. Monastic rituals and festival engage people throughout the year. The gompas and monasteries are venues for religious feasts. Buddhist festivals draw crowds of tourists as well. The architecture of Ladakh is equally mesmerizing with equal measure of Indian and Tibetan monastic style evident in the monasteries. The deep Buddhist approach is evident and dragon along with the Buddhist wheel is a common design at most monasteries. Women enjoy a highly elevated status compared to the other northern states of India. They take part in social and religious ceremonies like childbirth, marriages and festivals. Archery sport is a pastime for all in summer. The game of Polo is yet another popular sport here. Life in Ladakh is really challenging yet the people of Ladakh maintain unique smile on their face. Along with the impact of religion on the lives of the people, music and dance is an integral part of their lives.